In the Games Room, with Donna Prior in center. Image courtesy of author. 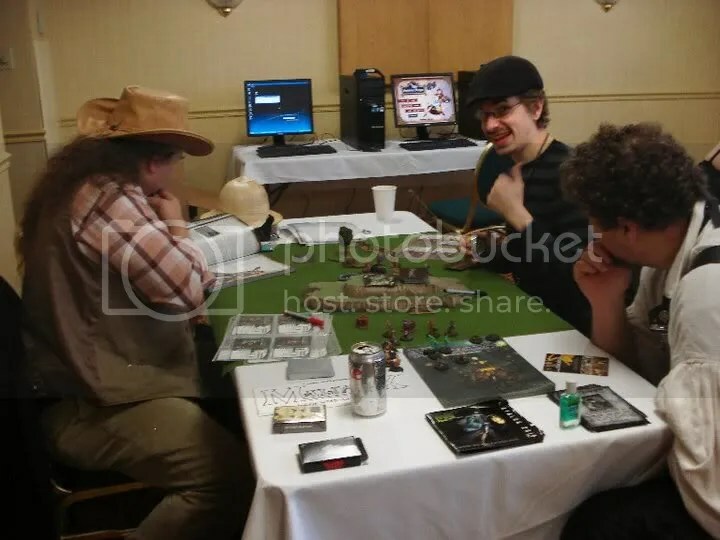 Steamcon II was a success in many ways; my specific draw to Steampunk is from a gaming point of view. 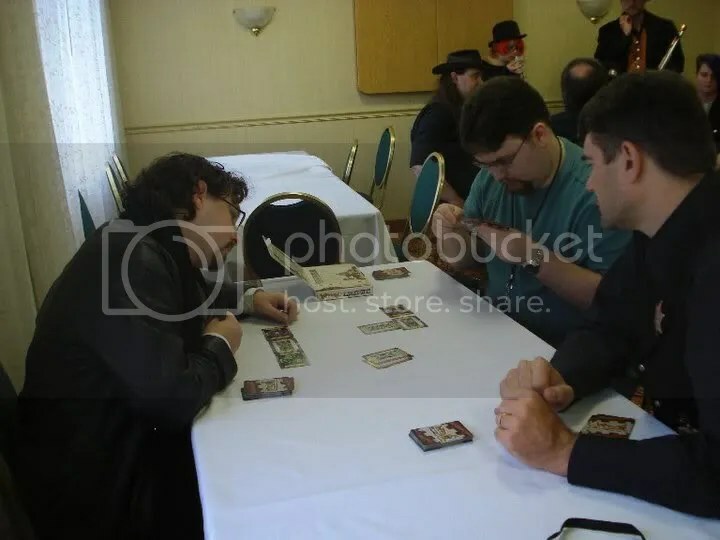 I’ve been gaming a good many years and I’ve been honored to be involved with Steamcon from the beginning meetings. 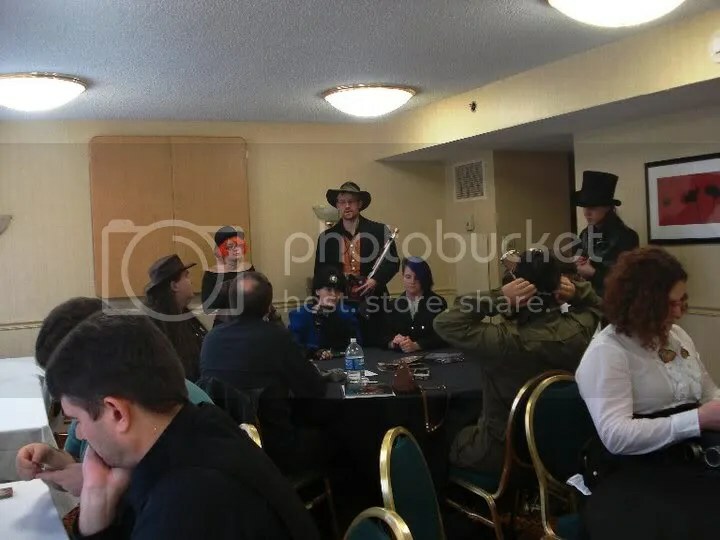 For my part, I took over booking & coordinating the games rooms for Steamcon I; for Steamcon II I scheduled a variety of games, contacted speakers and was delighted to be able to have a Games Guest of Honor. With our theme as the “Weird West”, I knew exactly who I wanted to invite. Thankfully, Shane Hensley, creator of “Deadlands”, was happy to come run some games and talk to people for our convention. 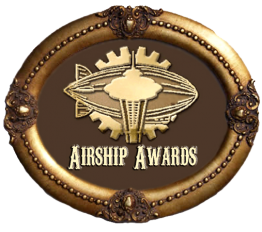 When we announced our Guest of Honors for Steamcon, I knew it would be a good one for Games. We soon had numerous RPGs (Role-Playing Games), miniatures war games, a variety of board & card games and two schedule LARPs (Live-Action Role-Playing). My first love is tabletop RPGs, so I searched out for a great variety of Steampunk-themed games, specifically if they were within our “Weird West” theme. Not only was Shane Hensley going to run a few Savage Worlds: Deadlands Reloaded adventures, but he also ran two games of Savage Worlds: Space 1889. Both were a huge hit with experienced and novice gamers alike. We showcased new games like Clockworks, Wildfire Industries “Industrialized Industrial”, Unhallowed Metropolis, Warhammer “Steampunk” Fantasy, Castle Falkenstein and more. The games I really wanted to play, but alas, was too busy to do: “A Trilogy of Steampunk Adventures, Inspired by Cherie Priest’s Boneshaker”. In the Games Room. Image courtesy of author. It is a big difficult to run full miniatures games unless someone is already bringing their army. With the amount of costumes, and a con which isn’t gaming-focused, demos are much better. You can learn the games, talk to people about painting and get a great experience with the amount of time you have available. We were happy to have Privateer Press & Wyrd Games back, with “Warmachine” and “Malifaux”, respectively. 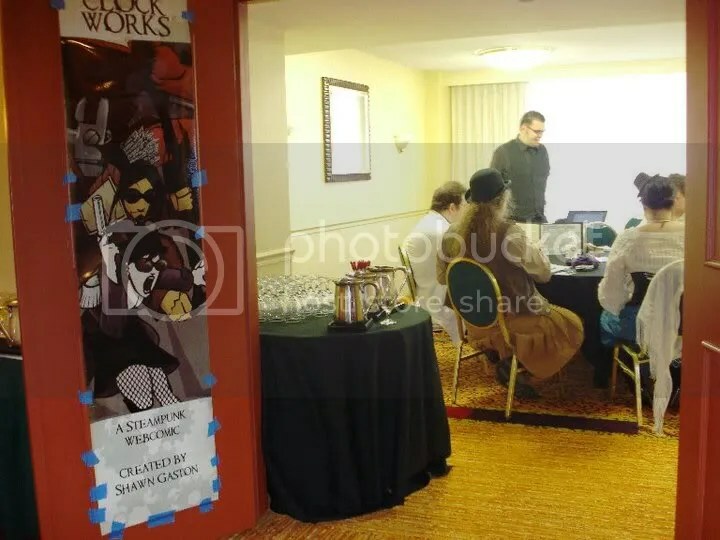 New to Steamcon was “Leviathans”, in development by Catalyst Game Labs. Miniatures Game. Image courtesy of author. We offered a variety of board & card games, which made it easy for non-gamers and gamers alike, to sit down and spend time socializing while learning something new. Some of the games were Red November, Girl Genius: The Works, The Great Brain Robbery, Gloom, Khronos, Red November (a big favorite), Deadlands: The Battle for Slaughter Gultch, Bang!, and the extremely popular Arkham Horror. We had a couple games of Arkham Horror that ran late into the evening. With our pending snowstorm, it was very spooky, to be sure! I had booked a few video games for Steamcon, but due to technical issues, we could only show a few of them. The most asked about games were Cogs, NeoSteam and Torchlight. We had lots of support from the respective companies, along with some new-to-me games, Everything Nice and Ye Olde Sandwich Shoppe. Overall, we were successful bringing so many steampunk/weird west games to people who won’t normally play games. We were able to also satisfy the more hard-core gamer, too. 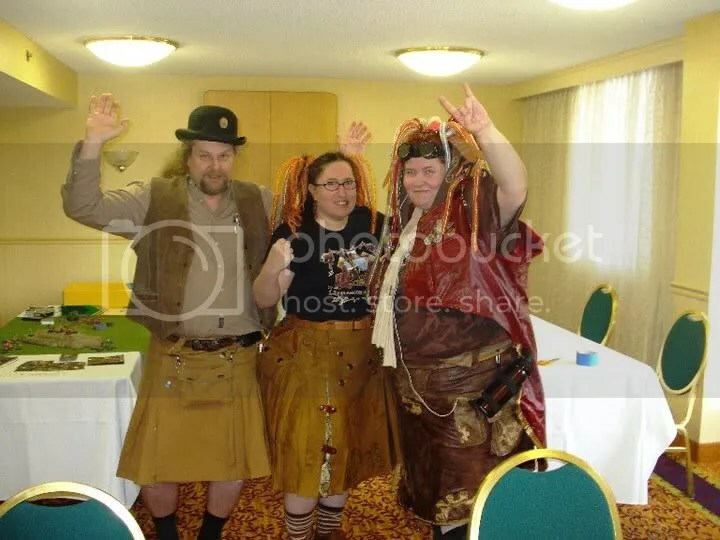 With numerous people ready to come back for Steamcon III, along with the dedicated volunteers, I know we’ll be able to bring more steampunk themes into the whole genre. Many people don’t consider themselves gamers, and then are surprised when they’ve spent a few hours getting to know people and enjoying their time with us. With next year’s theme being 20,000 Leagues Under the Sea, we’re looking for an even more creative and robust program. Donna Prior served as the Games Chair for Steamcon. She can be contacted through her LiveJournal.